Do you remember those glorious days when you were little, when the whole day could centre around the cardboard box your fridge came in? You could turn it into a den, or even in my case on one sunny afternoon, an outdoor puppet theatre completely decorated and painted. So that was the thought behind this shoot. I wanted a nostalgiac feeling, the den making and playfulness of a rainy day. This box has been sitting in our conservatory for about month- it's the one that the blue egg chair came in (see 'feeling the blues'). I have to admit, it was filled with gadgety things, cushions and blankets until this afternoon, as my little brother had commandeered it immediately on arrival for his very own hide-out. The images are divided into three parts. 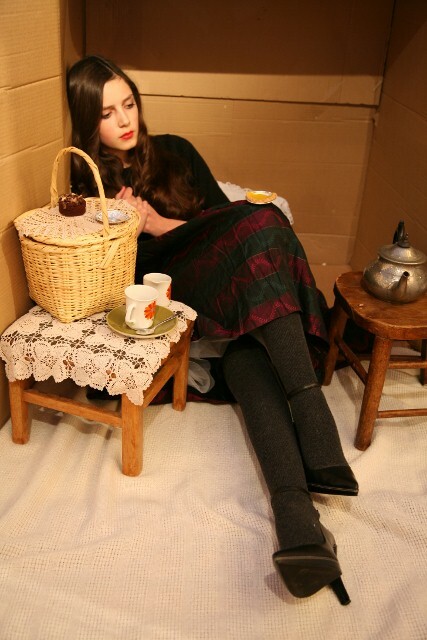 In a den, you often play 'house', so we set up some of the figures from the doll's house I had when I was little. 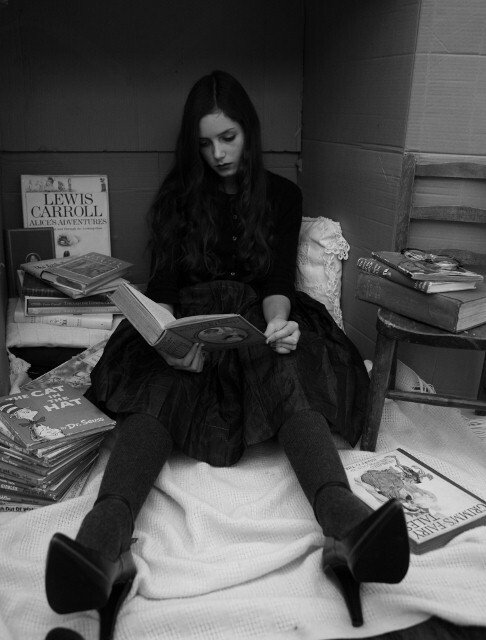 Also, I always read in my dens. So lots of classic books for me! And very aptly, we have a rather large collection of different editions of Alice in Wonderland. To finish, no den is a proper den without some food and feasting! 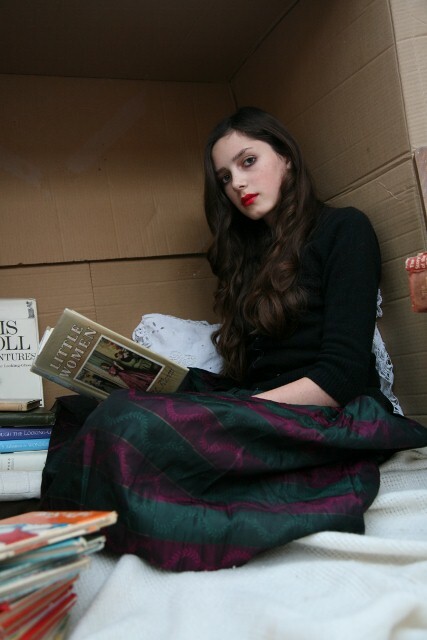 The skirt I am wearing here was bought by my mum at a jumble sale when she was eighteen. How I wish there were still jumble sales that would yield such treasures now. 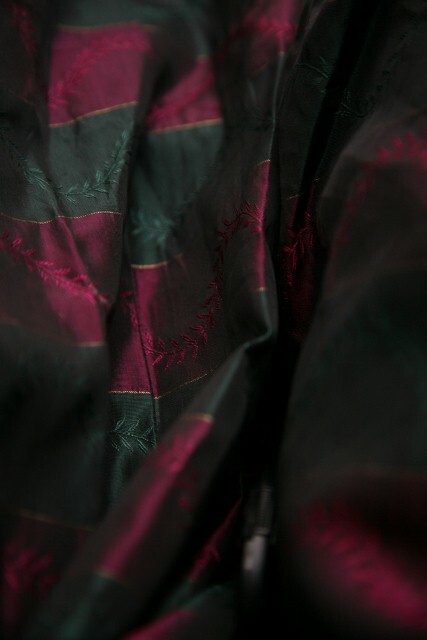 There is a close up of the beautiful fabric at the end because I love taffeta. The shoes were found in a charity shop (where else?) in their original box, I think made in Italy. And again a close up to show them in detail.The cardigan is my mum's and the belt is a vintage family one. The long socks are from H&M and the vintage watch is one I got from a flea market. Edit: I'm really sorry if your comment hasn't show up, it seems to be taking a while for some to be published. Apologies for technical problems. Oh it's so sweet :) You do look like a little girl playing. But you look fashionably gorgeous doing so :) Love it! Wow, great find on those shoes. They are nice and made in Italy. Awesome. Also, I like the photos in the cardboard box. Very creative childlike playtime setup. Great photoshoot! 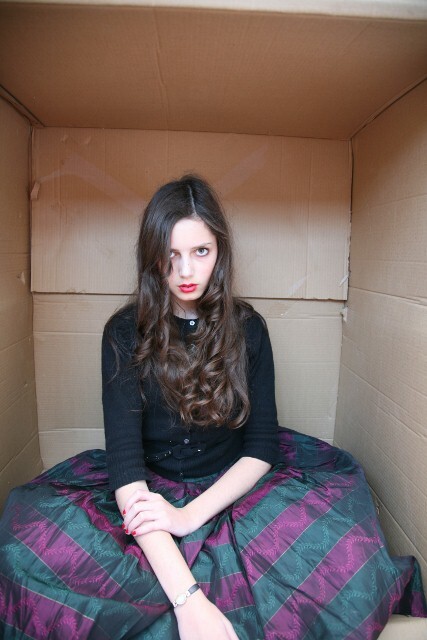 I remember when I used to go creep in boxes, then scare people. It was sort of like a little den. I but a little light into it, and I ate a chocolate bar aswell. It was quite fun, but then they had to take it away. Shame I can't do it anymore. I always looooove your photoshoots. This one is definitely no exception. I love the nostalgic feel, and the idea of just being like a child again. 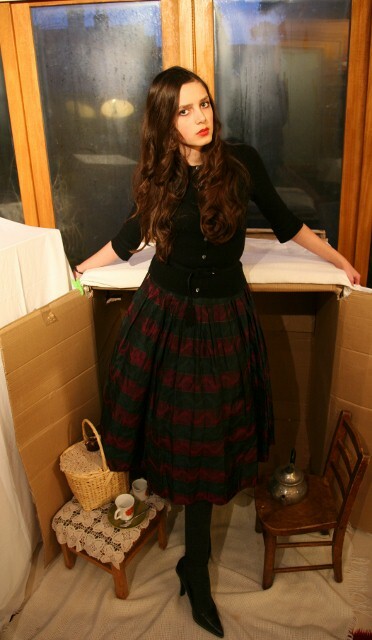 My favourite photos have got to be the one where your skirt is fanned out, and the ones featuring the picnic basket. Fourth from the top is absolutely my favorite, from any blog, in a long time. hahah I REMEMBER DOING THAT! The skirt and shoes are amazing! I loved bike riding and making up dances when I was little. wonderful:) theres really no better way to spend a sunday afternoon, is there? really loving those fierce shoes as well! I think my fave is the one of you looking down on the little women book. just very well composed. And your hair and outfit look beautiful! I love the board doll house. This is a cute editorial. I always love reading your blog! You look like a life size doll,living in your dollhouse. I really love all the photos. That skirt is so gorgeous and your small table and chair is so adorable! Gorgeous photos - who takes them for you? Oh, and those shoes are incredible. I need some. JEZZUS. No way, you are too cute for words! Well, the images are cute, you're stunning! I love your den, it's fab. When I was little, my favourite toy was a GIANT cardboard box which I took my crayons to, and coloured in, it was my home. I loved it, I went on a million adventures in my box, but then a Black Widow spider moved in aswell and my Daddy destroyed it! These phoos gives me a great childish feeling:) Thanks. The joy of boxes! We always made the smaller ones into cars with holes for you feet so you could run around in them Flintstones-style! Your right there is something so wonderfula bout taffeta! Lol i love the concept!! The strongest pictures i think are the ones with the books (i would die for gorgeous old bound editions that that- especially alice! ), it really feels as though you are lost in your own paper-bound world. My favourite shot is number seven: the cold porcelain colours feel sharp and other-worldy against the pops of red :) It's nice how the black and white picture has such a different feel- older and more gothic, and how the composition and your pose empathises this. l o v e your style. I love the red lippy! The 7th picture is just lovely. there have been a very similar alice in wonderland shooting with natalia vodianova in the past. This is such a great concept! I love the whole Alice and Wonderland feel t has to it! What great pictures!! :) You look so lovely. hehe only to be a kid again ;) so sool! your hair! the red lipstick! that skirt! this post is wonderful. i like the whole "alice and wonderland" feel. as children, on rainy days my brother and i spent many hours making "tents" from sheets, boxes, chairs, whatever. what fun! favorite childhood games- hide and seek was my first favorite, in which my mom and i would take turns hiding, then finding each other. sweet memories. You look absolutely gorgeous! You look like you just stepped out of another era. And that skirt! Wow!